No part of this publication may be reproduced, copied, or printed and distributed without the prior permission of the publisher. Are you ready to see the men in your life live with passion for the Lord, godly character, and great success? Are you ready to see God’s Word at work in their lives? Great! Let us introduce “Secret Gardening with A-Z Men of the Bible,” a Scripture based prayer model that the Lord gave me to pray for my husband over 22 years ago. In 1996, the Holy Spirit led me to study A-Z Men of the Bible. Then the Lord told me, “Send forth My Word into Wayne’s life.” I began praying for my husband by putting his name in key Scriptures associated with each biblical man. I thanked the Lord that He would continue to grow and prosper Wayne as a mighty man of God. And God did it, just like His Word says. Like “Jack and the Beanstalk,” I started seeing Abraham’s faith, Joshua’s success, Solomon’s wisdom, and more in my husband. Now, we want you to see “Secret Gardening” at work in the men in your life. How do you Secret Garden? Simply use the verses above, personalizing each one with the name of your husband, father, son, brother, co-worker, or friend! 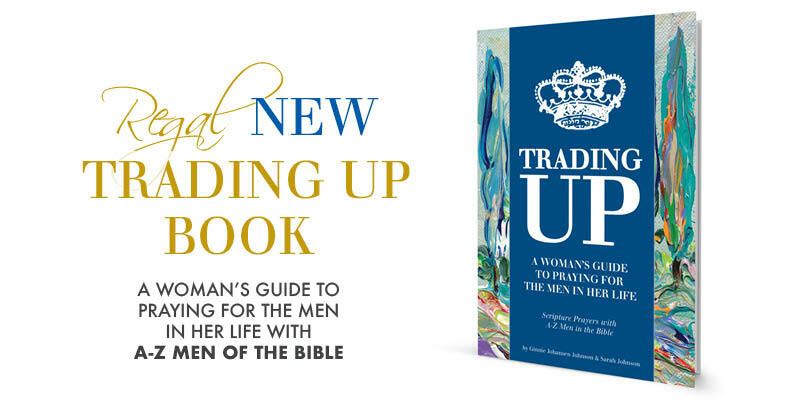 We also created a guide for you: Trading Up • A Woman’s Guide to Praying for the Men in Your Life - which guides you through Scriptural prayers with A-Z Men of the Bible. So let's trade in worrying and nagging and trade up to believing God’s Word, praying God’s Word, and watching God’s Word at work in all the men in your life! His Plans for You are GOOD!